Local 1863 Retirees Club organized an outing for its members. 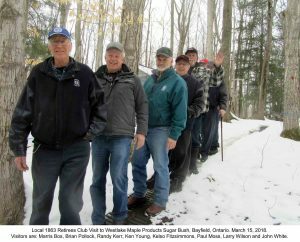 This was a visit to Westlake Maple Products, Bayfield, Ontario, and a tour of the sugar bush and maple syrup evaporator owned and operated by Ron Westlake, who is a retired IAM&AW LL 1863 union brother. 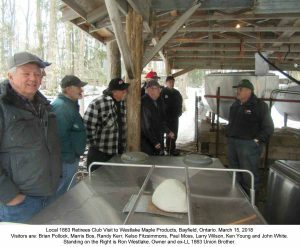 Union brothers, Marris Bos, Brian Pollock, Randy Kerr, Ken Young, Kelso Fitzsimmons, Paul Moss, Larry Wilson and John White taking picture were shown how the maple syrup operation worked. From the tapping of sap from the maple trees and collecting it in large vats, to the evaporation process and end product being bottled and marketed. Ron Westlake has operated this enterprise for many years, and the business goes back several generations in the Westlake family. Some of the end products are: pure maple syrup, pure maple sugar, and gift baskets are made to order. Attached are two photos showing the visitors in the sugar bush, and at the sugar shack with the latest equipment that Ron has invested in to produce the end products. Other tours and events are being planned by the Local 1863 Retirees Club for this year. This entry was posted in GKN, News, Retirees. Bookmark the permalink.